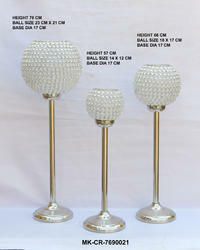 Aluminum stand with crystal diamond weaved ball. Elegant product for lighting. Supported by trained personnel, we are readily instrumental in presenting a comprehensive spectrum of Crystal Wedding Table Centerpieces. Crystal & Metal Centerpieces, with metal stand, silver look. We are dealing only in Bulk Orders.